Canadian Pacific Railway employees remove the rubber rail crossings from around the track at Ripley Street near the Freight House Farmers Market on Tuesday in downtown Davenport. Stretches of tracks in Davenport are being raised so trains can clear rising floodwaters on the Mississippi River. The new heights are a permanent upgrade, Canadian Pacific Railway media relations manager Andy Cummings said Tuesday. 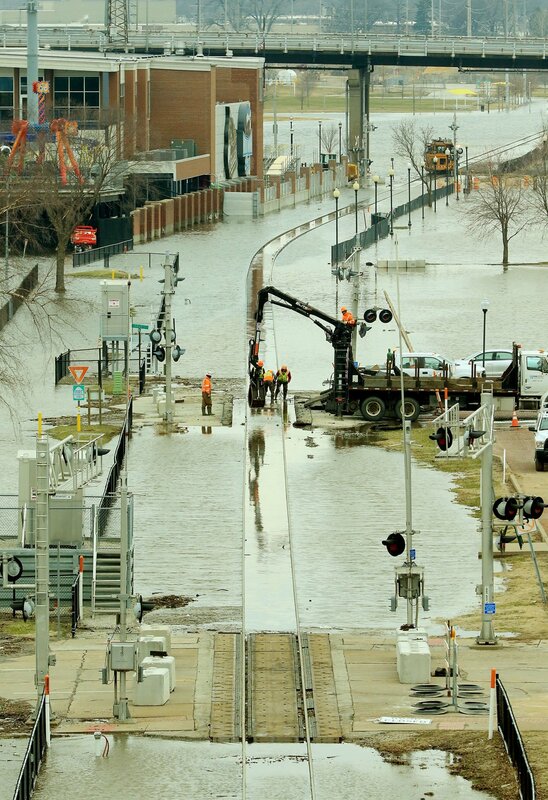 Stretches of railroad tracks near the Davenport riverfront are being raised so trains are able to clear the rising floodwaters on the Mississippi River. The new heights are a permanent "upgrade," a spokesman for Canadian Pacific Railway said Tuesday. The company is not required to obtain permits or city approval for the work because Canadian Pacific has the right-of-way, city officials said. The railroad company's media relations manager, Andy Cummings, supplied this statement: "The process CP is using involves lifting short stretches of rails and ties using heavy equipment and sliding crushed rock material under the ties. Once this is complete, equipment moves to an adjacent stretch of track and repeats the process. "The higher track will help ensure CP can continue train operations to meet the shipping needs of Iowa businesses and connect their products to markets across North America." The statement also says, "CP has been in close contact with the city of Davenport as this work has occurred." But Nicole Gleason, Davenport's assistant city administrator and public works director, portrayed the communication differently. "Canadian Pacific Railroad notified the city in mid-March that there were future intentions to raise rail," Gleason wrote in an email Tuesday. "There was not a projected start date given. "Work commenced on raising rail crossings on Thursday, March 28, without prior notice given to the city. As of today, we believe rail has been raised at various locations from Perry to Marquette." She added, "The railroad has indicated restoration work will be done to crossings once flood waters recede." Davenport alderman were informed of the matter during a Tuesday briefing with city administrators. Concerns centered on what will happen at the city’s seven railroad crossings, including questions over accessibility and travel constraints once the flooding recedes. Some aldermen also expressed a desire to get the state’s congressional delegation to intervene, saying the matter posed a possible public safety hazard if left unaddressed. Asked whether the tracks themselves will be restored to pre-flood levels when the water recedes, Cummings replied, "No, the upgrade is to assist in keeping train traffic in operation during current and future flooding events." The Times' Bill Lukitsch contributed to this story.